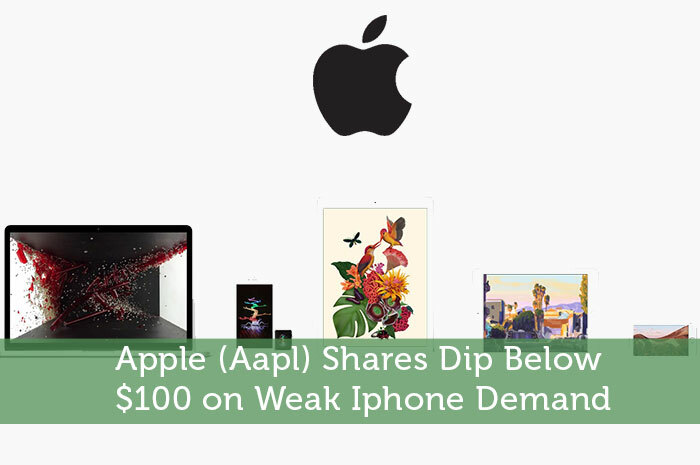 This past Wednesday, shares of Apple were hit hard on high volume, closing down by 2% to $100.70 per share. Although, shares did slightly dip below the $100 per share mark during the trading session. This drop occurred because a Japanese news service, known as Nikkei, published a warning that the recent March quarter would show a slowdown for Iphone demand. The Nikkei published that Apple expects to cut production of the Iphone 6 and Iphone 6 plus by at least 30%. Typically, a technology company with a diversified portfolio wouldn’t worry about such a decline in production. Apple has a diversified portfolio, but it has one major obstacle to overcome first. That obstacle is to eliminate the iPhone as its main source of revenue. It is no secret that the Iphone accounts for about half of the revenue Apple generates. This means that any slow down in Iphone sales would put a huge hamper on growth. For example, the company earned $51.5 billion revenue in Q4 2015 and iPhones accounted for $32.2 billion of that total revenue. The company needs to use its $205 billion cash in the bank to diversify itself more into other areas. In other words, it needs to become a technology company focused on innovation. Hopefully, the Apple Watch can somehow move the focus away from the iPhone being the dominant revenue generating product. The Nikkei attributed the weakening of iPhone demand because of inventory pile ups at retailers in various countries such as: Japan, China, Europe, and U.S. This isn’t the only time that Wall Street had warned investors about a slowdown in the March quarter. Back in December, the Wall Street Journal reported that many analysts were expecting a decline in iPhone sales as well. This was because many of Apple’s suppliers had pre-released some of their earnings. These earnings fell below a lot of analysts’ expectations, which caused analysts to cut forecasts for the iPhone in the coming quarter. The iPhone has been selling well for many years, so what exactly changed this time around? One major problem is that the new iPhone iteration didn’t have new upgrades over previous versions. Each iPhone cycle that came before had some type of new feature to differentiate it from one another. With the iPhone 6 and iPhone 6s being the same as previous versions, it is quite difficult for them to fly off the shelves. The weak iPhone demand is evidenced by a couple of the companies that have guided down for the quarter. Cirrus Logic guided lower for its March quarter. Analysts expect its revenue to come in at the$303 million range. This guide lower is due to weak iPhone demand. The company generates at least 70% of its revenue on Apple products. This doesn’t bode well for Apple when it reports in the coming March quarter. Shares of Cirrus Logic tumbled 9.5% on Thursday, to $24.25 in after-hours market trading, after the company lowered its outlook for the fiscal third quarter. The company noted that its third quarter revenue would come in at $347 million, well below analysts’ average estimates of $385.9 million. Another Apple supplier that guided down on Thursday was Qorvo. Shares of the company tumbled by 12.4% in after-hours trading, after it had stated that its third quarter revenue would come in at $620 million. Average Analysts estimated that it would generate $723.7 million in revenue for the quarter. The company attributes the guide down of estimates, because of a weaker than expected demand for mobile phones. Apple relies heavily on the iPhone products, and its needs a change in strategic direction. The reliance on iPhone sales has built up, as sales of the iPad have declined in 2015. In addition, sales of the Apple Watch have seen modest growth. The Apple Watch saw a small growth from 3.6 million units sold in Q2 to 3.9 million units sold in Q3 in 2015. The company must find a way to rebuild shareholder value, otherwise the market cap of the company will continue to deteriorate over time. Apple has lost $52 billion in market capitalization this year, and it needs to get its act in order to stop the bleed.